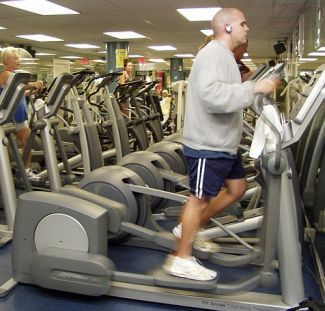 Compared to treadmills, elliptical machines are less known. However, if you need a low impact cardio machine, this is a much better option. The best cheap elliptical lets you start working out at home to lose weight, burn calories and get in shape. They also provide a workout for the upper body so you don’t only train your legs. Doing so helps burn more calories as your body has to work harder. This lets you skip to the price range your budget fits. Small Elliptical Trainer: Anyone who doesn’t have enough room to fit a full sized elliptical machine can get some of the cardio benefits of this mini elliptical. The unit does not come with the entire frame or moving arms and only consists of the foot mechanism. The mechanism on these mini-elliptical moves in similar motion as those in the standard machines. It does not however, offer as big a stride length due to its size. This is a great alternative to mini stepper machines should you prefer the more oval motion instead of the up and down step motion. It is also a cheaper, less space consuming option to the standard sized machine. This will let you fit it anywhere in the home, your room or even office you so can take a few minutes off daily to get healthier. The device is fitted with a basic LCD monitor for workout statistics feedback as well as a tension control knob so you can adjust how easy or difficult the resistance will be during your workout. Cheap Elliptical Trainer: For a full sized machine that’s very affordable, this slim, lightweight unit is one of the few available at this price level. As you’d expect, it does not come with a lot of bells and whistles but gives you the components needed to get a good calorie burning workout. Measuring 33 inches long, 19 inches wide and 46 inches high, it weighs around 55 lbs. and offers a maximum user weight capacity of 260 lbs. The unit also comes with moving arms that allow you to work your upper body as well which helps with the weight loss process. Due to its light weight and transport wheels located at the front of the unit, moving it from one room to the other is very easy and can be done by one person. What you get with this machine is a workout without much of the extra accessories. Resistance levels can be adjusted using the dial knob positioned over the wheel while the digital monitor offers basic information like time, distance and speed. Elliptical with Exercise Bike: With a extra seat feature, the Body Rider BRD2000 transforms itself for an inexpensive elliptical machine to one that also lets you use it as an exercise bike. This device is longer and taller compared to the Exerpeutic Aero Air and includes a workout DVD with it. The DVD will allow you to get started in your cardio routine. After that, you can go to YouTube and find more elliptical fat burning workouts to try at home. The longer length of this unit, provides a slightly bigger stride length of 13 inches compared to the Exerpeutic Aero Air. However, it isn’t as good as the large gym grade units which often have 18 to 21 inch stride lengths. This gives you a striding motion that’s closer to the circular stationary bike pedal rather than the walking/running stride. This is however expected with almost all cheap ellipticals. As the price goes up, so does the size, bulk and stride length. Overall though, for the price, this unit offers a combination of a seated workout on the fitness bike and a full body workout using the elliptical and moving arms. A notch above the exercise bike/elliptical combo machines is the 1000Xl from Exerpeutic. This is a compact elliptical that’s also good on the wallet. The unit offers a better resistance mechanism using magnetic tension. This enables you to adjust the precise resistance each time instead of estimating it using the tension knob. In total, the control console buttons let you select from 8 different resistance adjustments. This method also makes it easier to switch from low intensity to higher intensities without having to stop your workout and turn the knob. With a maximum user weight capacity of 300 lbs., and weighing 76 lbs., this unit is built more solid than those above, which results in a more stable workout with less of the wobbling specially if you’re exercising at a high level of intensity. One extra feature the machine has is the moving handlebars are fitted with pulse rate sensors. This lets you keep track of your heart rate as you workout. Elliptical with Recumbent Exercise Bike: For versatility, we love that this machine lets you use more than one type of workout machine. This two-in-one package is much better than the elliptical-upright exercise bike combo above for people who have back issues. The back rest allows you to extend you workout sessions without straining the back. Of all our units in our review here, this offers the best stability thanks to its wide base. This ensures that the machine stays very stable and sturdy while you go through any movements. It also offers the highest weight capacity at 350 lbs. As far as features are concerned, this ProForm Hybrid Trainer is miles ahead over the units we’ve featured above. It comes with a longer stride length for comfort, 14 workouts and 14 levels of resistance you can set using the console. It also tracks more information above your workout. Best Cheap Elliptical Trainer: Among the low cost ellipticals in our reviews, the A40 by Schwinn offers both advanced features and a good comfortable motion. The good sized 17 inch stride length makes it very natural to use. It is also equipped with a flywheel that allows smooth striding motion as well as quiet operation. As far as function is concerned, it offers 8 different resistance levels as well a 7 built-in fitness programs both of which combine to let you switch up your training and make sure that you stay challenged and not bored with exercise. Among our picks here, this offers the most high end control console with a large graphical LCD display. The console is also lined with quick control buttons that let you set things with one click. Included in the system’s tracking are RPM, time, speed, calories, heart rate and resistance levels. All of which allow you to see how you’re doing in real-time. For the money this is a good machine to have at home as it costs much less than many similar models yet offers a full range of features as well a a smooth running mechanism and good sized stride length. For working out at home, these elliptical machines offer a much more quiet way to exercise. They also offer a lower impact means of cardio so your bones and joints don’t feel any wear and tear or pain even after going long distances.